Lionel Barrymore's 61st birthday celebrated at MGM with a few of his friends! Norma Sheaerer on his right and Rosalind Russell on his left. 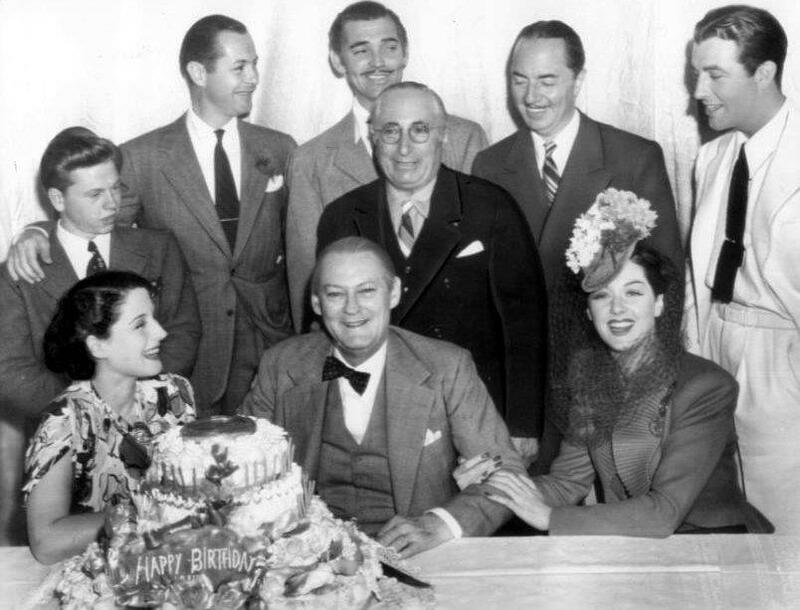 In back of him he has Mickey Rooney, Robert Montgomery, Clark Gable, Louis B. Mayer, William Powell and Robert Taylor. Known to have been a reluctant performer in a family full of them, Lionel Barrymore is much loved for his annual performance as Ebenezer Scrooge on various old time radio programs. His biggest gig was in The Story of Doctor Kildare, in the role of Doctor Gillespie. Gillespie was the older doctor who graciously mentored Kildare. He was the mayor of the town Mayor of the Town, a 1940s radio series, and made many appearances on Lux Radio Theatre, Command Performance, and Kraft Music Hall. He would go on to shine as a screen actor in such movies as It's a Wonderful Life and A Free Soul, winning an Oscar for the latter. Ask your friends if they know who was born today in 1878. Tell 'em Lionel Barrymore -- that's who!